IndieBound Desciption: As a young man, Almanzo Wilder will meet a brown-eyed, brown-haired girl named Laura Ingalls and fall in love. But as a young boy, Almanzo has no time for girls. His life is about farming and chores, and most of all, about wanting his own horse. 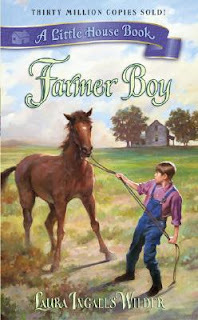 Before his dreams can come true, Almanzo must prove to his father that he is ready to take on more responsibilities - and this is harder than he ever imagined. My Thoughts: I grew up with all the Little House books, often imagining myself as Laura. I was a little sad that they reissued the books with different covers (I read the "classic" cover on the right) but anything to get them in the hands of today's readers! Because, I loved those books. I loved reading about the houses, the farms, the clothes and the FOOD! I have to admit, I really loved reading about the food. 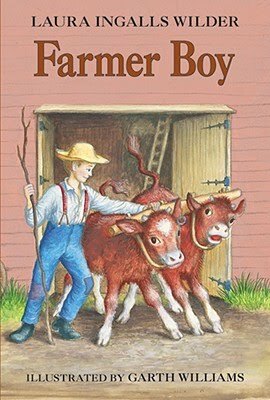 That is why FARMER BOY ranks pretty high as one of my favorites in the series. That boy can eat and, oh, how I loved to read about it. That might be a reason why I write so much about food in The Year of the Dog and the The Year of the Rat! Those food descriptions have stayed with me since I was a child, so much so that as an adult I even made apples'n onions!